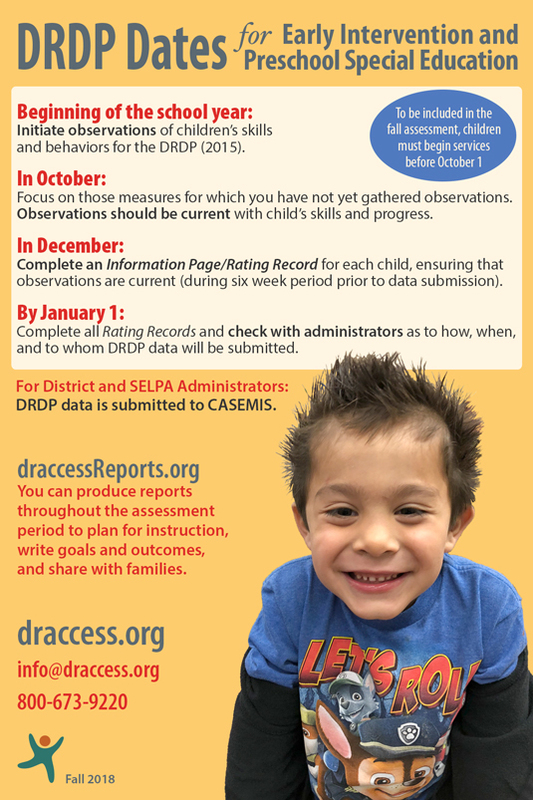 On this page you will find a chart of the general timelines for submitting DRDP (2015) data to the SELPA and to the California Department of Education’s CASEMIS system, as well as postcards outlining DRDP (2015) submission dates. Note: These dates are general – consult your program administrator for the specific dates for your program. Initiate observations of children's skills and behaviors for the DRDP (2015). Focus on those measures for which you have not yet gathered observations. Observations should be current with child’s skills and progress. Complete an Information Page/Rating Record for each child, ensuring that observations are current (during six week period prior to data submission). Complete all Rating Records and check with administrators as to how, when, and to whom DRDP data will be submitted. For District and SELPA Administrators: DRDP data is submitted to CASEMIS. You can produce reports throughout the assessment period to plan for instruction, write goals and outcomes, and share with families. Observe and document children's current skills and behaviors. Rate measures and gather information on measures needing more documentation. Complete and submit your DRDP data by your SELPA’s due date. After entering Rating Records, print reports at DRAccessReports.org to plan instruction, share with families, and inform goals and outcomes. Children must begin special education services before March 1 to be included in the spring assessment. Confirm the due date for submitting DRDPs with your administrator. 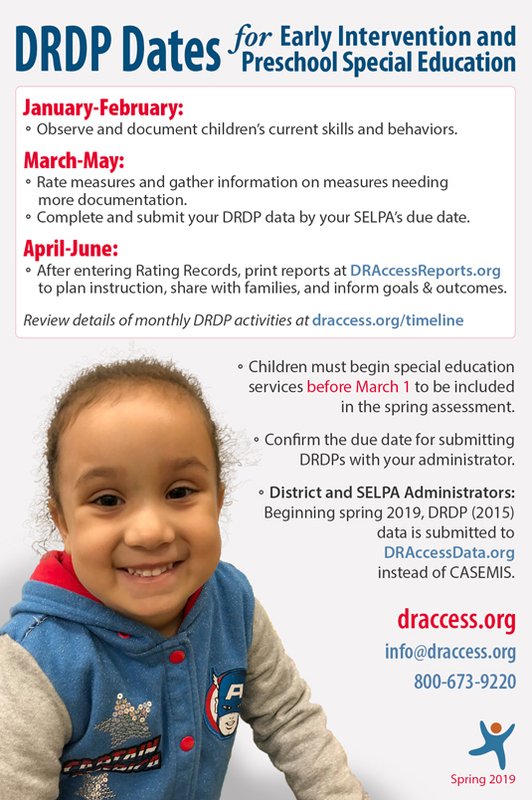 District and SELPA Administrators: Beginning spring 2019, DRDP (2015) data is submitted to DRAccessData.org instead of CASEMIS.